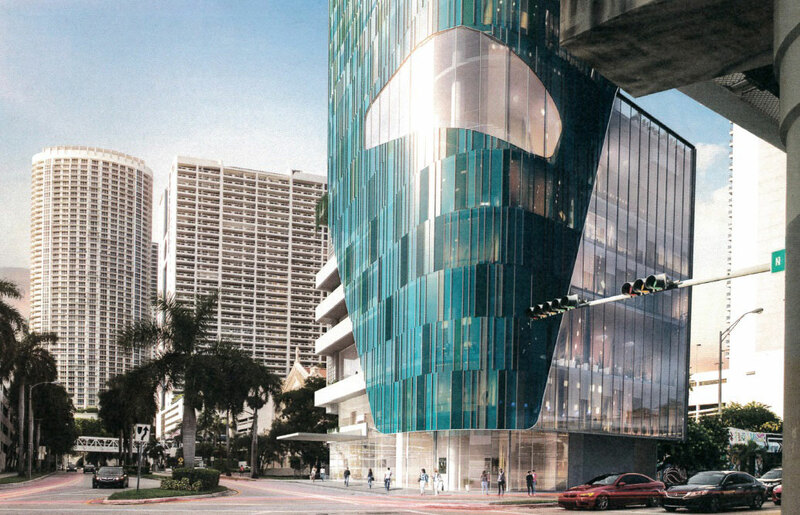 A hotel wearing a cloak of colored glass is planned a block from the bay in downtown Miami, with no on-site parking. Mandala Holdings proposes the 43-story hotel on a corner at 511 NE 15th St., next door to Trinity Cathedral on North Bayshore Drive. The property is about a half block from the Adrienne Arsht Center Metromover Station, and adjacent to the waterfront owned by Genting Group (former Miami Herald site) where a resort and marina are planned. The mixed-use hotel would include 270 rooms, four top levels of offices with two devoted to Mandala use, a rooftop bar, and 715 square feet of retail. Levels 3 to 5 are identified on plans as bistro, dining and events space. The architect is Allan Shulman. Mario Garcia-Serra, an attorney for the developer, said the company hopes the project sparks more development in the Omni area. The developer is requesting less required parking, all to be off-site but within 1,000 feet of the hotel. The city’s Urban Development Review Board on Oct. 6 recommended approval, with conditions. Other board members took issue with a drop-off and pick-up area that would provide only four spaces for vehicles operated by hotel valets. A developer’s representative pointed out that some hotel patrons can self-park at the nearby Omni garage, and he noted nearby public transit. Review board Chairman Robert Behar said he shared concerns voiced by colleagues but commended the architect for a “dynamic” building on a small lot of 11,545 square feet. Board conditions include the developer studying the functionality of the loading area, committing to lease 117 off-site parking spaces for at least 20 years, and considering larger shade trees near the building. As long as you have members of the UDRB insisting on parking pedestals on every new tower built downtown, traffic will only get worse. No on-site parking? No parking? Where will the 300 employees park? 50 employees per shift? 270 rooms. No parking for guests? No parking for trucks making deliveries? Ommni won’t be that, down the line and if it’s a bad idea now, requiring a 20 year lease is not the solution – kicking the can down the street. What is the WORST thing that could happen? Some people…maybe…park on the street? take the bus or mover to work? park in one of the multiple nearby lots? have trouble parking? Are so frustrated that they can’t get to work that they quit their job there, so someone else can have it? It might work or it might not. Let them try and see what happens. They probably have employee parking but not public parking. They need to have parking! Why don’t they make it higher and put in a parking garage. You cannot depend on the Omni or street parking and Venetia cannot accommodate extra cars. city’s employees start walking to work and stop using their cars. Thus set an example to the rest of us. They give excuses such as New York is like it. Well, they should stay in NY and leave the rest of us alone. C’on….open your eyes, stop craving about parking, a thing of the past. Deliveries before 5am everyday, and employees use public transport. See Chicago, Madrid, NYC, Hong Kong, London… Car transport is simply unsustainable, no way downtown Miami can handle any more traditional drive to work. Time for Miami…To grow up! We’re not NYC with a transit system that comes from all corners. And I hope they have ZERO Meeting / Event space as there would be no way to efficiently provide valet parking service. What about the people paying exhorbitant taxes who just want to get to and from home using the Venetian Causeway? What rock did this “architect” crawl up from? And what City did s/he design this for? Eliminating on-site parking is a gift to the developers and a huge inconvenience to the public. Once again the City of Miami favors the developers at the public’s expense. Requiring on site parking is a gift to the car manufacturers and the suburban developers. They know better than the government whether or not they “Need parking.” There is no public benefit to requiring it. Quite the opposite. Why should developers willing to build smartly in the urban core be forced by the government to further subsidize drivers coming in through our neighborhoods, making it impossible for our elderly and children and to safely cross the street and walk to school? If you think it will be inconvenient to hold a meeting there, rent a room, or work there, you are blessed with the choice to put your meeting or rent a hotel room in one of the hundreds of buildings with a required parking garage attached to them. There is literally 0 inconvenience to the public at all. Why don’t they simply build a multi level basement below the new hotel!! The technology for this is now being done in other major high rise towers in Miami. This is also standard procedure in every other major city development. probably because it is very expensive and the hotel will be literally attached to Metromover and a bus terminal?